Ankhs And Others added to site. This is a compilation download I made which is comprised of live cover versions and originals not recorded in studio apart from the song We Can't Wait which was recorded for the Shy Folk album but didn't make the cut. Live Radio Takes 1995 added to site. One of the last recordings available featuring Chris, Kate and Dave. Happy Valentine's Day - until further notice all the BTC Albums can be downloaded from the respective album pages on this site. Alumni albums added including Chris Brown and Kate Fenner, Chris Brown, Kate Fenner, David Wall and Andrew Whiteman. Chris Brown and Kate Fenner will be playing at The Ottawa Folk Fest on August 27th from 4:30 - 5:45. Details can be found on the Ottawa Folk Fest Site. Chris Brown's band Open Heart Society will be playing a series of shows at The Piston in Toronto (937 Bloor St. W, Toronto, Ontario M6H-1L5 - 416-539-3989). Open Heart Society features Chris, Eric Schenkman (Spin Doctors), and Sarah McDermott. Sunday September 4th they will be joined by Chris Miller, Gregor Beresford and Dave Wall to play some Bourbon Numbers! Just got word that the book Have Not Been The Same will be reissued in the new year! Liz Marshall's Documentary "The Rawside Of The Bourbon Tabernacle Choir" is now available on iTunes for $1.99. First Taste Of Bourbon Cassette added to the site. This is the first cassette released by the band and only 100 copies were made. Flash Video added to site including Toronto Rocks appearance from 1987. Liz Marshall's Documentary entitled "The Rawside Of The Bourbon Tabernacle Choir" will be shown on the Independent Film Channel (IFC) on December 2 2008 at 8PM EST. From the Exclaim site. After ten years and thousands of shows, Canada's best bar band called it quits in 1995. Now after a 13-year hiatus, singer/songwriter Chris Brown must try to put the Bourbon Tabernacle Choir back together for one last gig at the world renowned Hillside Music Festival in Guelph, ON. But band members struggle with fractured relationships, inflated egos and the difficult task of staying relevant in this day and age. Will Chris be able to recapture the magic that once was or will he watch his beloved BTC crumble for the last time? Directed by Liz Marshall. Photos and Video from Hillside added. 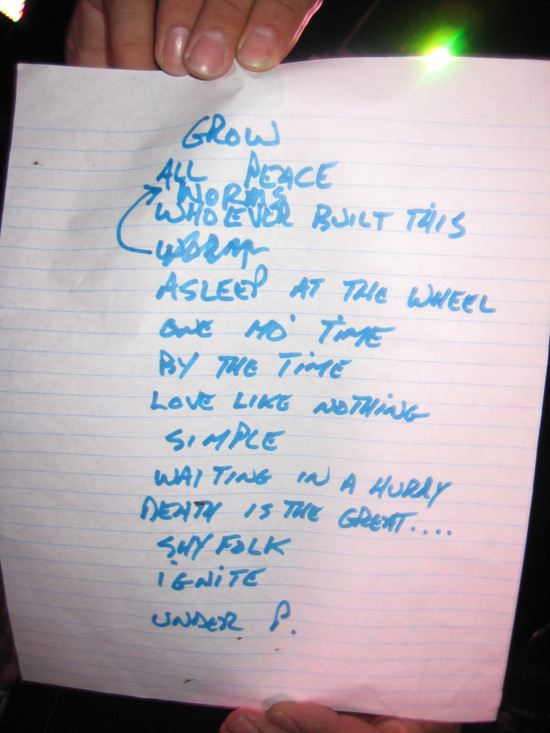 Hillside Setlist (held by Gene Hardy): Not played were Waiting In A Hurry, Death Is The Great Awakener, Shy Folk and Under P. Go to the Hillside Page for more info. A new article from The Village Post July 2008 edition can be found in the articles section. It is official. After a 12 year long summer break The Bourbon Tabernacle Choir will be playing at Hillside 2008 - July 25-27 in Guelph Ontario. Bourbons will be playing Saturday July 26 on the Main Stage. The band lineup will be - Chris Brown, Kate Fenner, Chris Miller, Jason Mercer, Dave Wall, Gene Hardy, Andrew Whiteman and Tom Bona (plus guests). Tickets go on sale May 3 at 10am. Go to http://www.hillsidefestival.ca/ for all things Hillside. WHOOO HOOOO!!! IF YOU HAVEN'T BEEN ALREADY, THIS IS YOUR CHANCE TO GET BOURBONIZED! Every Thursday night in September, The Citizens' Band will host Thursday nights at The Dakota Tavern (249 Ossington) - The first two weeks will feature Kate joining the band and special guests performing songs from her new album. - 249 Ossington Avenue at Dundas Street - 416-850-4579. Ultrasound Showbar July 8 1992 show video and audio added. This was not a BTC show but featured Gordie Johnson, Kate Fenner and Dave Wall performing covers, standards and some songs from Dave Wall's solo "Lozenge" album. The Diamond Club show from Toronto March 04 1989 added. This is the oldest live show I have found so far. It is taken from the VHS shot by Mama Wall which is also up in flv and mov format (mov is zipped). The Tangerine Club show from Toronto March 23 1989 added. This is the second oldest live show I have found so far. It is taken from the VHS shot by Mama Wall which is also up in flv and mov format (mov is zipped). It contains the song Destruction from "A First Taste Of Bourbon", features cameos by Kate and Peter Mercier and has Sean James on sax. Audio for September 28 1991 show (taken from video) added as well as individual video tracks for show. 45 Minute Live video from Lee's Palace September 28 1991 added. Horseshoe Tavern Show from December 23 1994 added courtesy of Richard Clegg. Three new shows added both courtesy of Jon Lax. Clinton's Tavern 1992 with The Hopping Penguins, Lee's Palace February 7 1992 and Lee's Palace November 30 1991. Coming soon - new live shows and new Bourbon Live video. The Blue Zone Ottawa - September 2 1989 show added. Sound Samples added to shows so you can check the audio quality. Here is a link to an article on The Torontoist Blog regarding the fact that you can not buy any Boubons albums. I have just set up a new site called The Canadian Music Forum. It is going to be a resource for where to find information on Canadian Bands on the Net (presently under construction). It is also a huge Music Forum for all Canadian Band discussions old and new, present and extinct. Bourbon Myspace page started up. Chris and Kate are playing at The Living Room in NYC tomorrow (Saturday March 17 at 9PM). A whole bunch of new articles, promotional material and Object Ankhs (including original artwork) added courtesy of Jon Lax. More material will be uploaded shortly. Jon also provided me with about 15-20 live shows which will be added as I can convert it. THANKS A MILLION JON. YOUR CONTRIBUTION IS GREATLY APPRECIATED BY ME AND WILL BE BY ALL FANS. New Articles added. Make Amends Promo Single CD artwork added. Object Ankhs added. Photo Feature added. January 27 1995 show from Halifax Nova Scotia provided by Tim M. (via Jon Lax who used to run the original BTC Money Boy site). A huge Thank You to Andy F for providing two new live shows for the site. These are DAT recorded, awesome sounding shows from The Town Pump in Vancouver January 29 and 30 1993. The January 29 show is not complete but the Jan 30 one is (save for Domino which can be heard on the fade of Sam And Richard). Note that Chris Brown will be opening up for The Apostle Of Hussle at the Grad Club at Queen's University, Kingston, Ontario on Saturday February 10 at 8:00PM. Also Chris and Kate will be playing at Marion's Continental in NYC on Monday February 12 at 8PM sharp. Articles Section added and links to Thomas Trio and The Red Albino with BTC live from Halifax 1992 on Youtube. Dave Wall is playing at Harbourfront Centre Theatre, Toronto: appearing as part of The Art of Time Ensemble; An Evening of Jewish Music with a fantastic group of musicians, including Marilyn Lerner, David Buchbinder and Martin Van De Ven. 23 Minute Ear To The Ground Special on the Bourbons added. This was a CBC series from 1992 which profiled up and coming Canadian bands. I also have Thomas Trio and the Red Albino (who were an awesome live band), Leslie Spit Trio and Rheostatics which appears on my Rheostaticslive website. Nightingales NYC 1992, The Diamond Club Q107 Broadcast 1992 and Lee's Palace 1991 shows added. The Lee's show was taped by Gary Gottlieb, an old friend of mine. He was the guitarist for the bands "After Hours" and "Funkasaurus". "After Hours" played at the first High School Battle Of The Bands at The Concert Hall in 1985. The same show where the Bourbon's played for their "first" show. I have added info and artwork for all the albums I have including Sister Anthony, Superior Cackling Hen, Shyfolk, 1985-1995, a couple of singles and also the History page.